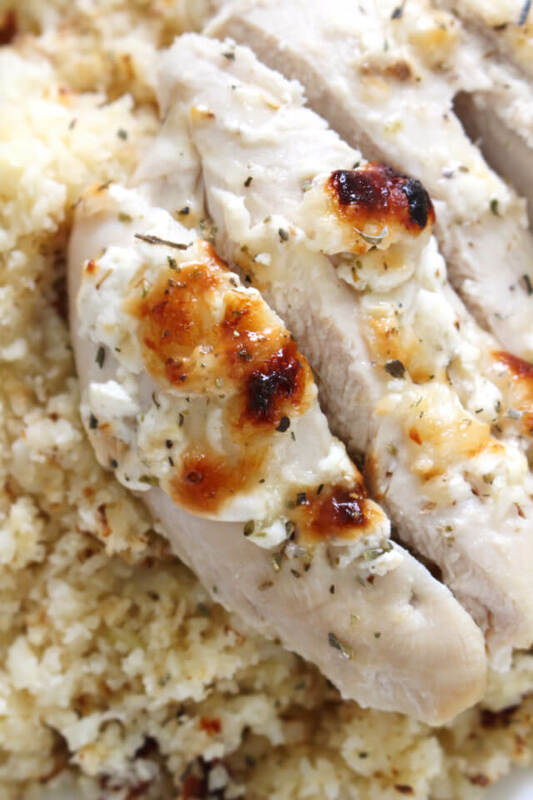 This Parmesan Chicken and Cauliflower Couscous that comes together in just 30 minutes is perfect for meal prepping! By prepping four lunch-sized portions in advance, you are setting yourself up for success by making it easy to make a healthy choice. The other day, a friend of mine on Facebook messaged me asking if I had any recipes on the blog that would be good for meal prepping. You're familiar with meal prepping right? It's where you do a little bit of cooking at the start of the week and then portion out your meals so that's it's easy to make a healthy choice. You can do this for breakfast, lunch, dinner, and snacks, but I prefer to focus on lunch. That's when I will usually find myself reaching for a bag of chips instead of something better for me. I'll end up mindlessly munching on chips, which is obviously less than smart. So, anyway, I started looking through the blog archives and I realized I don't actually have that many healthy-ish recipes that can be adapted for the meal prepper. I mean, I found a few recipes. My Turkey Taco Stuffed Peppers are a great choice. And my Kielbasa Hash is awesome reheated. Then there're a few soup recipes that might work, but that's about it. My healthy eating section is apparently lacking. So, I've set out to beef up my recipes that can be made, portioned, and fit the bill for the person out there who's logging their food and counting their calories. First up it this super yum chicken. 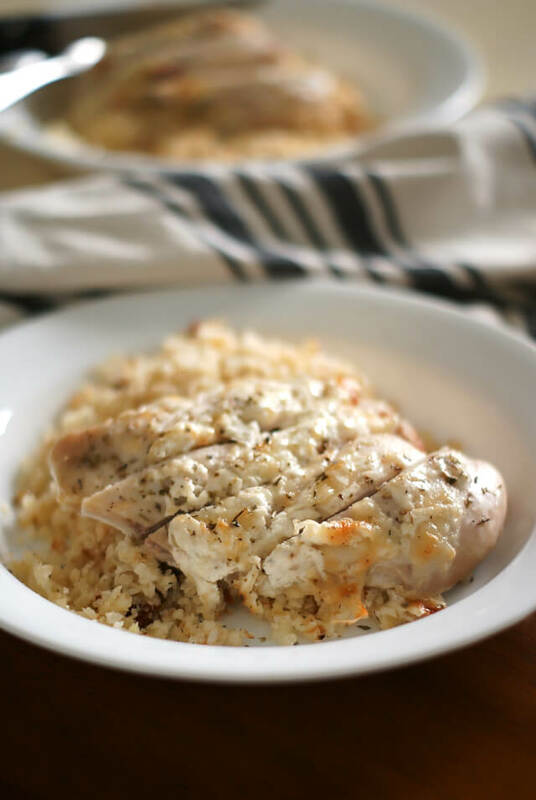 Chicken is a great lean protein choice and, paired with cauliflower that mimics couscous, you have a healthy, filling lunch for four out of five days of the week. Check out my Meal Prep Parmesan Chicken and Cauliflower Couscous video below! Stay tuned for more tasty and healthy meal prep ideas coming to the blog soon! Sign up to receive every new recipe by email or follow along on Facebook to make sure you don't miss the new stuff! Preheat your oven to 425 degrees. Line a baking sheet with aluminum foil. In a small bowl, mix together the greek yogurt. parmesan cheese, salt, pepper, and garlic powder. Place chicken on the baking sheet and top with the parmesan mixture spreading to cover the top of the chicken. Bake in the preheated oven for 25 minutes, or until chicken reaches 165 degrees. Meanwhile, pulse the cauliflower florets in batches in your food processor until it is the texture of couscous. Heat 1 Tbsp of olive oil in a large skillet. Add the cauliflower and cook for 5 minutes, stirring occasionally. Push some of the cauliflower to the side and add the 1 Tbsp of olive oil to the pan. Add the garlic and pine nuts to the oil and cook for 1 minute. Add the lemon juice and chopped sun-dried tomatoes to the pan and stir until everything is well combined. Season with salt and pepper, to taste. Top with the parmesan cheese. Portion the cauliflower couscous and chicken into four containers and store in the refrigerator until ready to eat. Reheat as desired and enjoy! You can jazz up your cauliflower couscous with whatever you'd like! I think pesto sauce, balsamic vinegar, or fresh herbs would be great additions.